JOIN THE 1000 BOOK CLUB! The single most important thing you can do to prepare your children to read is to read to them every day. Research proves that children need to hear 1000 books before they begin to learn to read independently. Reading to children will increase their vocabulary and their listening and narrative skills. Reading with children will also help to instill in them self-awareness, confidence and an understanding of their place in the world. The program is sponsored by the Chesley Memorial Library with help from Northwood School teachers. Liam Cooper was our first “1000 Book Reader” but not the last! Miles and Mabel Winslow, Evelyn Seavey, Norah Seavey, Abigail Costanzo and Kirie Morrill, Jake and Ruth Lakeman are all “1000 Book Readers” and we hope to add more names soon. Congratulations to all of them! 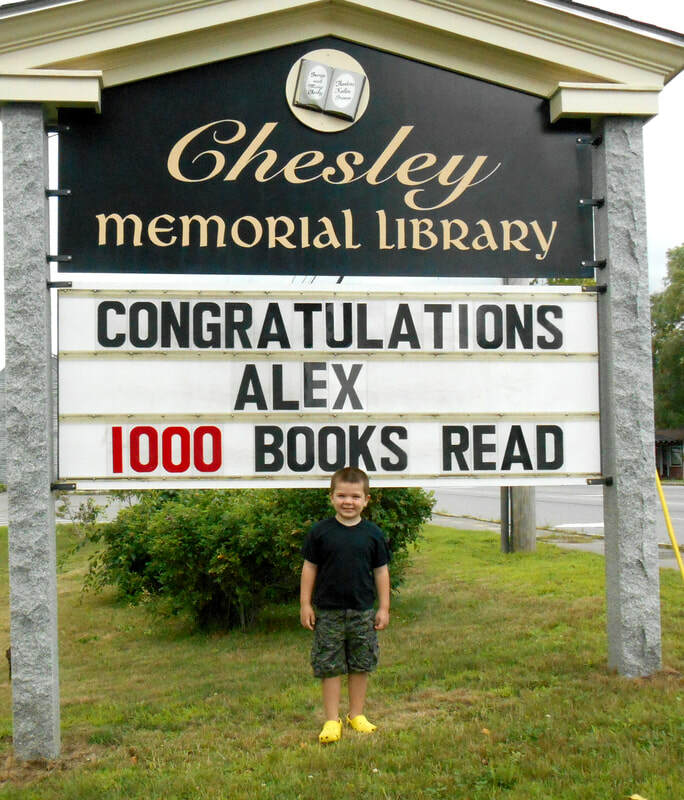 We recognize the readers on the sign outside the library when they reach their goal and post their names on the “1000 Books” wall display in the library’s youth room. We are looking forward to more names joining them soon! More Congratulations to the following participants entering kindergarten: Peter Faris, Norah Naleid, and Marlena Thorn. We are very proud of our young readers! 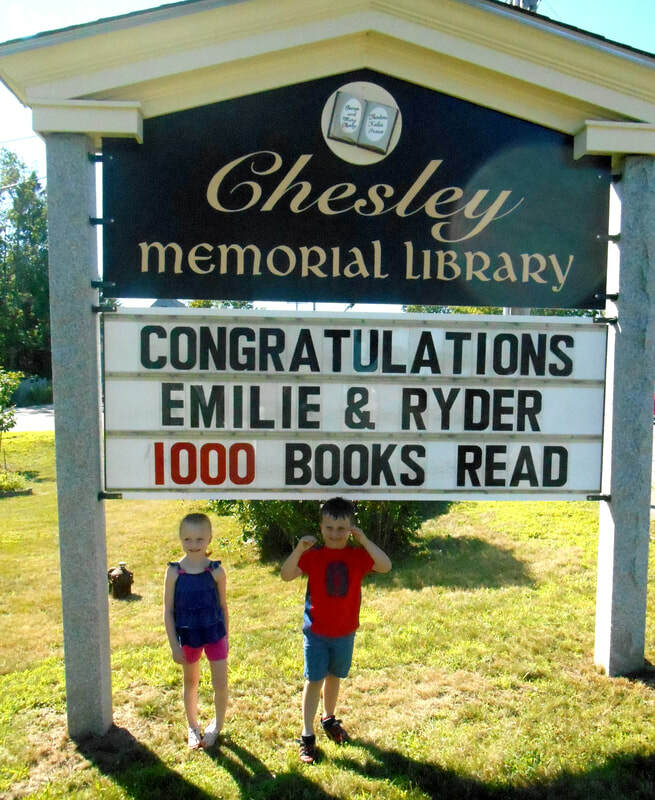 ​Congratulations go to George and Lucy for reading 1000 Books! ​Congratulations go to Eleanor for reading 1000 Books! Great job Eleanor! Congratulations go to Emma for reading 1000 Books! Great job Emma! 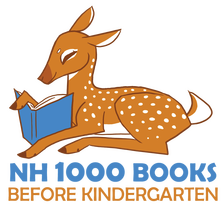 We have more 1000 Books before kindergarten readers in 2018! Our 1000 Books before kindergarten readers in 2018! 1000 Books Before Kindergarten Club! You can register at any time all year long.